My first experience in Nicaragua was in mid-July 1989, as part of an eight-member delegation from Baltimore, MD, sponsored by our friendship-city project, Casa Baltimore/Limay. In Managua we attended the 10th anniversary celebration of the Sandinista Triumph over Somoza, held in the Plaza of the Revolution near the old cathedral. Several of the current obstructions (such as the Presidential Palace and fountains) had not yet been built, so there was plenty of space in the Plaza for the gathering. I remember the crowd as huge, even larger than the 25th anniversary. My strongest memory is how festive the event was. People were dancing gaily to the music and whirling large red-and-black flags. The women in our delegation danced with Nicaraguan men when they invited us. Many other people formed large human gymnastic pyramids of four levels or even more; they sometimes wavered or toppled, then bolstered themselves and rebuilt before collapsing in delight. The crowd cheered their efforts. On Thursday mornings during that period, U.S. expatriates and visitors held a regular picket outside the U.S. Embassy in Managua to object to our government’s policies, particularly the continuing funds for contra activities. Our delegation attended one of these protests. I remember my feeling of irony as I gazed at the razor-wire topping the fence outside the Embassy, apparently to protect the Embassy from us – juxtaposed with the very polite armed Nicaraguan soldiers guarding it – as we marched outside in a circle with our signs. We all had a special treat that week, when the actor Kris Kristofferson showed up, singing and playing his guitar. Afterward we headed toward our friendship town, San Juan de Limay, near the Honduran border in the Department of Estelí. Bob Ganter, a former Baltimorean working with Veterans for Peace in Managua, drove our van. When we turned off the Pan-American Highway onto an unpaved road, we suffered two tire punctures, one after the other, from sharp rocks. Luckily, Bob had two spares and changed the tires with minimal grumbling. One memory from the Limay visit is the level of activity and participation by many people. For example, we attended a Biblical reflection by a Christian base community (comunidad de base), a group of 30 or so Limayeños gathered on a Saturday evening to discuss the personal and communal meaning for them of a selected scripture passage. The method used was based on the theology of liberation, namely, that people have the collective wisdom to interpret the Bible, to free themselves from oppression, and to create a good society – and that God wants this for them. Our delegation held regular reflections on what we were experiencing. On one occasion I shared that I wasn’t sure what had been on my bed the night before: I was definitely sharing my cot with a young child, but something else alighted on my feet during the night – probably a chicken, but I wasn’t sure. Everyone in the group thought that was pretty funny and teased me about it afterward. Toward the end of the trip, I shared that I didn’t want to go home; I wanted to stay. Bob Ganter responded that if I really felt that way, I should stay. There were many opportunities for meaningful work, and I could make it happen. I didn’t stay; other duties called me back to the U.S. 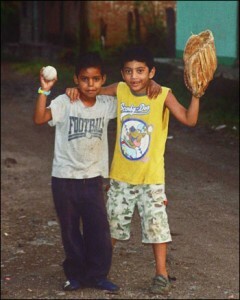 But my heart has never really left Nicaragua, either. I’m hooked; I’ve now gone there nine times and I’ve become an active advocate for this wonderful country.